The Russian General Prosecutor’s Office has provided non-governmental organisations (NGOs) with the first details from the inquiry into alleged war crimes by Georgian forces in South Ossetia between August 7 and 12. All the data below has been provided by the Investigation Commission of the Russian General Prosecutor’s Office. RT reproduces the information as part of a joint project with the Investigation Commission to make the information available. 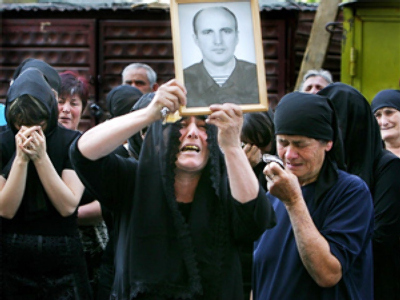 Investigators collected more than 4,000 statements from people who claim they were victims of physical, material and moral attack as a result of the Georgian assault on South Ossetia. The Russian General Prosecutor’s Office says Georgia’s military actions amounted to an attempt to ethnically cleanse the region of South Ossetians. The following statements were submitted to the Russian General Prosecutor’s Office by witnesses. Amiran Goyayev: “The Georgian army fired grenades into the basements where civilians were hiding, fired at those running away, ruined a wooden church in the village of Khetagurovo where people had found shelter”. Lyudmila Tasoyeva: “A car carrying people was shot at by Georgians in Tskhinval. The family in the car, parents with two children, were still alive. Gasoline was poured over the car and it was set on fire”. The inquiry has established that 52 Russian peacekeepers were killed as a result of the Georgian army’s attack. Thirteen are missing and 229 are wounded. A further 755 people were taken to hospitals in South Ossetia, five of them died later. Apartment buildings, schools, public buildings and infrastructure were destroyed in the city of Tskhinval and the villages of Khetagurovo, Dmenis, Sarabuk, Tbet, Zar, Rustav, Znaur, Didmukha, Ubiat, Mugrut, Arknet, Bekmar, Velit and Leningor. The inquiry’s conclusions were reached after more than 600 observation missions to residential areas. A further 12 observation missions were made to Georgian firing positions and sites where peacekeeping forces operated. Many of these sites contained destroyed Russian and Georgian military equipment. More than 5,000 items and documents have been collected as evidence of criminal actions by Georgian forces. These include military maps dealing with mass shelling of Ossetian residential areas.